We have put together this guide with information about Origin aluminium windows. As well as helping you understand where you can use Origin Aluminium Windows we also explain the types of property they’re suitable for. A house featuring a variety of Origin casement, fixed, gable and dummy sash windows. Homeowner information about Origin Aluminium Windows. Origin windows are suitable both for the replacement of existing windows. They also work well in new extensions and new-build houses. Origin aluminium windows are primarily marketed at the homeowner. However many commercial buildings have Origin windows. The definition of a commercial contract is anything that is not residential, for example, offices, warehouses or factories. Commercial jobs can also involve large or small-scale developments of flats, apartments and houses., such construction companies building new homes. Any structural opening that needs a window fitted in it can suit an Origin aluminium window.and not just a dwelling. Origin windows also come in different window types and styles. A casement window is one that has an opening light that opens out. Casement window opening lights come top hung, where the opening light hinges fix on the sides, with window handles at the bottom. The top hung window opens outwards from the top. Side hung casement windows have the hinges fitted on the top and bottom. The window handles sit on the left or right side. The window opens outwards to the side. Origin windows with dummy sashes. Typically an opening window with an opening element also consists of fixed panes as well. Where the opener is adjacent to a fixed pane a sight line discrepancy occurs between the opener and the fixed panel. This is because the opening section has additional material making the opening part appear thicker than the fixed part of the window. When this aesthetic discrepancy occurs the fixed and opening part of the window do not sit level. Therefore, this is where dummy sashes help. Dummy sashes or dummy vents are essentially the same profile as the opening element of the window. This opening element is fixed into the frame. Essentially looking like an opening window but fixed. Of course, you can choose to have all window panels opening if you wish. With a dummy sash, you get a consistent neat sight line. The window fixed and opening elements look exactly the same with equal proportions and equal glass sizes. Usually, a window with dummy sashes looks much better than one without. Origin aluminium windows are available with both standard and dummy vent arrangements helping achieve equal sight lines. Many post and pre-war houses and those with original timber windows feature a dummy sash design. Therefore Origin aluminium windows help to replicate the original sight lines of older windows. They suit modern houses and window styles that require a consistent look in the home. Therefore, when you do your research to get information about Origin aluminium windows, consider whether dummy sashes are better than conventional fixed panels. Furthermore, for suburban semi-detached or detached house with decorative fanlights in the Fleur-de-Lys or similar style, dummy sashes help these panes of glass look centralised and correctly positioned. One of the biggest advantages of an Origin aluminium window over other makes of windows is that bigger window sizes are possible. This includes the very popular gable style of windows and gables above bifolding doors. A gable window is triangular in shape. It usually fills the shape a roof creates or in a new opening designed in a gable shape. 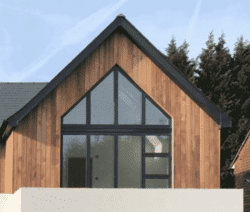 Origin gable aluminium windows are possible at extensive widths and heights. They also incorporate both fixed and opening elements as well as dummy vents where needed. Origin windows are also widely used as dormer windows. A dormer window is fitted where a roof protrudes outwards and can create great architectural features. Origin Dormer windows are widely used in attic or roof conversations. Useful for where the pitch of the roof is lower and headroom restricted. 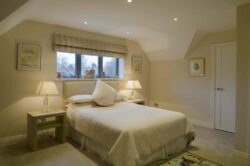 Dormer windows provide light and extra headroom. Origin aluminium windows can also be made as Dormer Gable Windows. Origin bay and bow windows. By using purpose-designed extrusions, Origin windows can be crafted as both bay and bow windows. There are many different types of bay and bow windows. A bay window is usually with angled projections. Bow windows are more curved in appearance. Origin aluminium windows in either a bay or bow design come as fixed or opening windows. Optional dummy sashes are available as well. 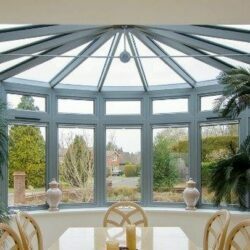 Origin bay or bow windows work with the leading conservatory and orangery roof systems. They also work with Origin entrance doors and bifolding doors, creating impressive glass rooms. For those looking to create large picture windows and glazed screens, the strength and thermal properties of Origin aluminium windows make them ideal. A combination of square or gable windows comes made at small or large sizes. Therefore create large floor-to-ceiling windows in a traditional or contemporary style. Origin Windows with entrance doors. Origin aluminium windows are also compatible with the entire range of Origin front doors and residential entrance doors. 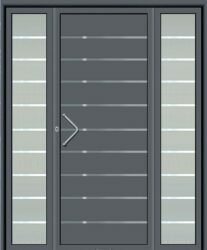 Thinking about a new Origin aluminium entrance door? An Origin window couples to it perfectly, creating a door with a sidelight or a door with a toplight. Use the Origin door transom and also create a specific design. Origin windows combined with doors create multiple combinations of front doors, rear doors or side doors. Use Origin windows and doors as part of a porch, a bedroom door or anywhere needing a door and window combination. Origin Windows in Commercial Buildings. 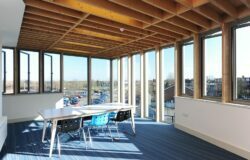 Commercial buildings such as schools, shops and offices also benefit from Origin casement or fixed windows. Windows are the same irrespective of the building type, available in any type of fixed, shaped and opening configuration. Advantages of Origin Aluminium Windows. 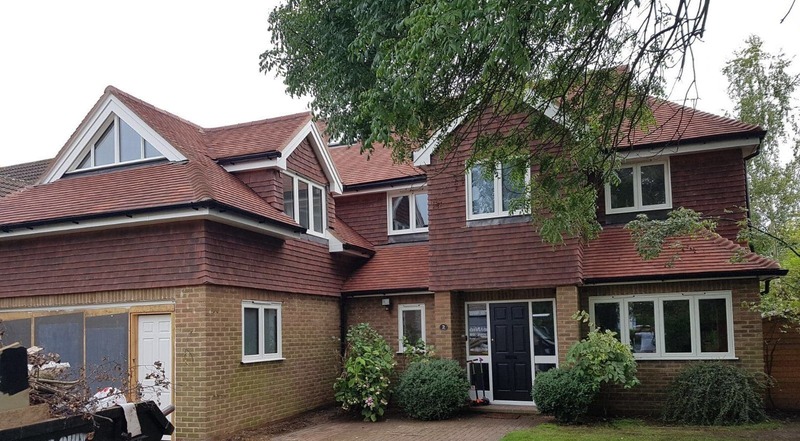 There are many great brands of aluminium windows on the market, however, the Origin suite of aluminium windows has features other aluminium systems do not. Here are just some of them. Aluminium windows with a 20-year guarantee. A unique flush casement arrangment inside and out. Aluminium windows manufactured only by Origin. Excellent lead times over virtually any other window brand on the market. Enhanced U-Values with Aerogel upgrade. Contact us today if you would like more information about Origin aluminium windows and where you can buy them. The main image shows Origin windows supplied and installed by UK Windows Surrey.